Shea Patterson, the No. 1 dual-threat quarterback and No. 3 overall recruit in the class of 2016, committed to Ole Miss on Tuesday, picking the Rebels over LSU and USC. 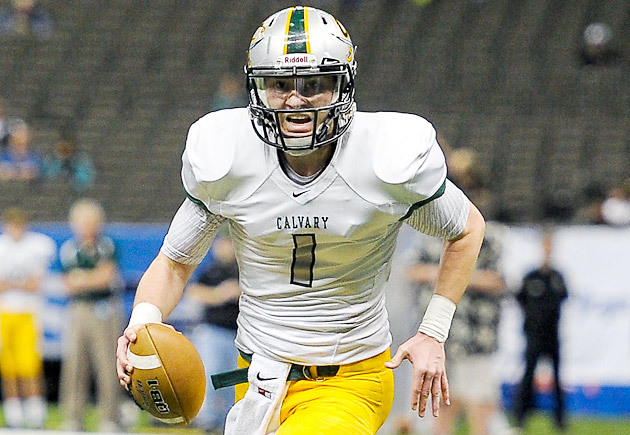 Five-star quarterback Shea Patterson announced Tuesday that he has committed to Ole Miss, slipping on a Rebels baseball cap during a ceremony at his high school. The highly regarded Patterson has the ability to hurt defenses running and throwing the ball. In its latest top 100 rankings, Rivals.com pegged Patterson as the No. 2 quarterback—behind Lake Stevens (Wash.) High standout and Georgia commit Jacob Eason—and No. 1 dual-threat QB in the class of 2016. The 6’2”, 191-pounder said in an interview with #D1Bound last month that he models his game after Green Bay Packers standout Aaron Rodgers. Patterson passed for 2,428 yards with 38 touchdowns and only three interceptions this season while leading Calvary Baptist Academy (La.) to a second consecutive state championship. Tuesday marked the second verbal commitment from Rivals.com’s No. 3 overall recruit in the class of 2016. Patterson pledged to Arizona as a freshman but backed off last July. The decision to reopen his recruitment came less than a week after his brother, Sean Jr., reportedly left his role as a graduate assistant at Arizona for a position at LSU. Shea said in an interview with NOLA.com in December that Sean Jr. has served as his quarterback coach his “whole life” and that he feels most comfortable wherever Sean Jr. is. In a text message to The Shreveport Times earlier this month, Sean Patterson Sr. disputed a report that Sean Jr. had resigned from LSU and was expected to take a job at Ole Miss. Other reports have also linked Sean Jr. to the Rebels. Shea Patterson’s commitment is welcome news to a Rebels team that endured three seasons of inconsistent quarterback play from Bo Wallace. The “Good Bo, Bad Bo” mantra that came to define Wallace’s career shined through in his final college game, a 10-of-23, three-interception, zero touchdown performance in a 42-3 Peach Bowl loss to TCU. For LSU, believed to be among the schools in the running for Patterson, not landing the in-state product will only exacerbate concerns about the Tigers’ quarterback situation. Neither Brandon Harris nor Anthony Jennings distinguished himself last season, and the Tigers added only a two-star QB in their 2015 recruiting class (four-star Feleipe Franks is a 2016 commit). If Patterson sticks to his pledge, he has the potential to be the most impactful recruit of coach Hugh Freeze’s tenure to date, though not quite the most highly regarded. Two years ago, the Rebels landed the No. 1 overall recruit, defensive end Robert Nkemdiche, as the centerpiece of a banner class that ranked No. 7 in the country. While Patterson projects as a top-notch starter in 2016, Ole Miss’s quarterback situation for ‘15 is murky. The Rebels added juco transfer Chad Kelly, but Freeze recently acknowledged the possibility of “embarrassment” with Kelly, who was arrested in December after reportedly fighting with bouncers. The Rebels added a three-star quarterback in the class of 2015, Jason Pellerin, but Kelly is expected to battle redshirt sophomores DeVante Kincade and Ryan Buchanan for the starting spot. Last season the two players combined for one touchdown and neither attempted more than 25 passes. Even if Ole Miss doesn’t find an answer at quarterback this fall, Rebels fans can at least take comfort in the hope that their team’s future at the position is among the best in the country.